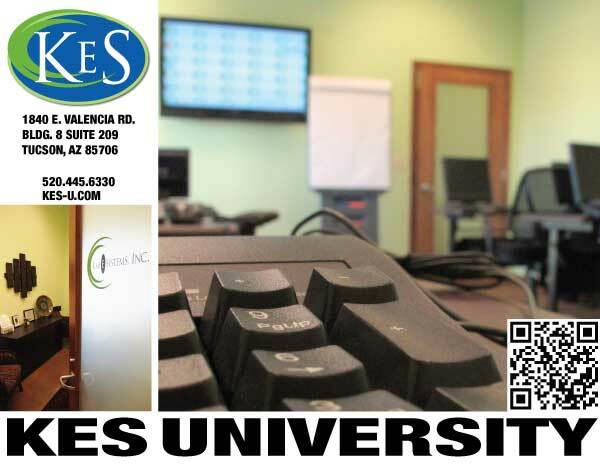 We have a state of the art computer Training facility in Tucson, Arizona that includes a classroom with 16 computers, conference space, multimedia, and more. This space is available for your training sessions and group facilitation. Kais E Systems has access to more than 200 sites all over the world from Paris to the Pacific. If you prefer to have training conducted away from your workplace, we'll work with you to find an accessible, quiet, fully equipped setting in a location convenient for your training group. We are happy to provide these opportunities at your site or a nearby location. Because we do the traveling, we are able to reduce your time away from the office and the expense involved in sending employees to expensive, timeconsuming venues. We will tailor the classes and schedule to fit your needs. Kais E Systems is certified by the National Association of State Boards of Accountancy and offers a huge array of training and educational opportunities for your workforce. Whether you are looking for "off the shelf" methods or specific, customized training, we can provide you with the educational tools you need to increase the effectiveness of your workforce. We understand that adults have specific ways of learning and we have customized our training modules in order to maximize the educational experience for this target group. Adults are selfdirected, generally know what they need to learn, have accumulated valuable life experience, are goal and relevancy oriented, and want experiential, "real time" training that they can utilize in the workplace right away. Our innovative techniques create an atmosphere that is relaxing and mutually respectful, addresses all levels of learning (visual, auditory, and experiential), collaborative, and insightful. We offer training at your workplace or at one of the convenient sites associated with H. Q. Global Workplaces. At Kais E Systems, our personal approach to workplace education is designed to get significant results and meet the unique needs of each business. Let us work with you to design a curriculum that will help you achieve your organization's mission and bottom line goals. For more information about specific classes, click here to view our course catalog.